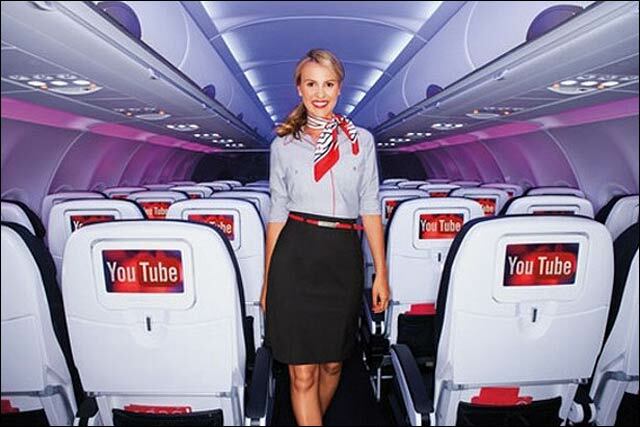 YouTube is now riding on a jetplane, pairing up with Virgin America in the company’s first distribution deal with an airline for its online channels. The airline will make programming on five YouTube channels — Warner Bros.’ “H+ The Digital Series,” produced by Bryan Singer; WIGS’ “Blue,” starring Julia Stiles; Geek & Sundry’s “Written by a Kid”; “Crash Course”; and Barely Political’s “The Key of Awesome” — available through its inflight entertainment system on Dec. 15. More are expected to follow. The content will be available for free on all of Virgin America’s flights in the U.S. and Mexico. For YouTube, putting the channels in front of more viewers is seen as a way to promote the programming on a new platform, where auds are eager to turn to video to bide their time during flights, and hopefully encourage them to seek out the shows after they’ve landed. At the same time, Virgin America now has another partner through which it can offer free entertainment on its seatback screens. The airline already has content deals with other production shingles that distribute much of their shortform programming online like Will Ferrell, Adam McKay, Chris Henchy and Judd Apatow’s Funny or Die; Ben Stiller’s Red Hour Digital; Seth Green and Matthew Senreich’s Stoopid Monkey Prods. ; AEG; Vice; Relativity Media and Rogue; Barry Katz Entertainment; What’s Trending; Steven Schneider (“Paranormal Activity”) and Vevo. Variety is a partner as well. Those partners play their content on Channel 11, which Virgin Produced programs for the airline and Richard Branson’s other Virgin brands. Last year, Virgin America said it would quadruple the number of videos it offers through its inflight entertainment system and install larger seatback screens; usage of the Red-branded system has increased 20% a year since 2008. The airline’s nine-inch monitors were already 25% larger than in-flight entertainment screens on domestic coach flights. Virgin America was the first domestic carrier to offer fleetwide Wi-Fi in 2009, enabling flyers to connect to YouTube through their own mobile devices.